Win the Lottery . . . Guaranteed! Here in the U.S., we all just suffered from another bout of lottery fever as the Powerball Lottery climbed to an astronomical prize of over half a billion dollars. If you are reading this, chances are you knew someone who bought a ticket. I certainly did, and I began to dream about what I would do with all that money. Not surprisingly, I did not win. The odds of winning are 175,000,000 to 1. To put that in perspective, you literally have a better chance of being struck by lightning or being eaten by a shark than you do of winning the lottery. I always believed that if I could just win the lottery, I would be able to do what I want in life. In fact, I think that is what powers lottery fever – the belief that money is the answer to our dreams, when in fact that is terribly wrong. The truth is, I don’t need money to fulfill my dreams in life. And I bet that is true for most people. The dreams and desires we have do not rely on money, but rather in a belief in ourselves and the courage to take that first step to do what we have always wanted, even if it goes against conventional wisdom. That is the true secret of those we admire with successful, fulfilling lives. They took the risk, sometimes against great odds, and believed in themselves and their dream. They followed their belief, their heart and their passion. And rarely do those people meet with failure. They either succeed in fulfilling their dream, or they feel satisfied that at least they tried. The worst thing we can do in life is go to our grave knowing we didn’t even try. Thankfully, life is not a lottery where all we can do is hope to win against great odds. Life is a culmination of our actions. It is a story that is inspired by our dreams and can be made real simply by believing the story we tell ourselves and having the courage to act upon it. Once that first step is taken the path reveals itself. And step by small step the life you desire miraculously appears. This awesome video celebrates your courage, a belief in yourself and that magnificent first step!! I’ve had the good fortune to hike the tallest mountain in 5 states: California, Vermont, New York, New Jersey and South Dakota. 14,494 feet! It’s all in your altitude! At 14,494 feet, Mt. 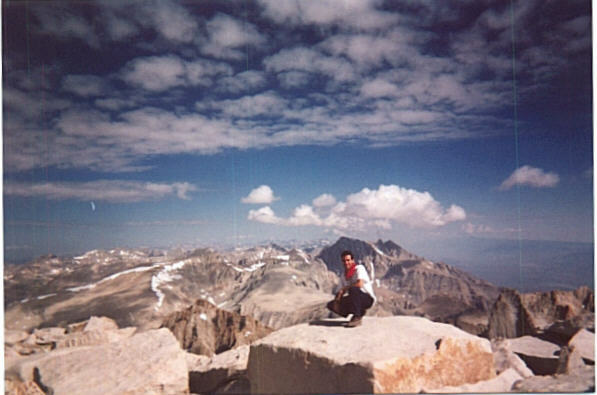 Whitney in California is the tallest mountain in the continental US. From the summit of Harney Peak in South Dakota, I could see both Mt. Rushmore and the Crazy Horse monument, which is still being carved into the granite mountain face 60 years after its inception. From the peak of Mt. Marcy in NY, known as Tahawus, The Cloud Splitter, I literally witnessed the thick clouds that blanketed the area all morning being parted to reveal the gorgeous valley below me. All of this just moments after I said a prayer for the victims of 9/11, which occurred just days before. It was truly mystical. This summer I decided to add 5 more peaks to the list as I set my sights on climbing all 50 in the US. Sounds impressive, right? Perhaps, but don’t let the images of Mt. Everest delude you. Not exactly a grueling adventure or something to recount magnificent tales about . . . except for one thing. The commitment. I didn’t really have a strong desire to visit Delaware. And it certainly didn’t require much effort. Nonetheless, at some point Delaware’s highest “peak” needed to be visited to achieve the goal. And sometimes, goals that appear as insurmountable mountains must begin with the molehills. Often, success in one’s goals is not about who is the best skilled or the one with the most training or the one with the most natural talent. Success lies in one’s commitment and the promise they make to themselves. And sometimes, that first step toward your promise is all you need to propel yourself to the life and achievements you desire! What is it that you are called to do this summer? Don’t overwhelm yourself by choosing the Mt. Everest of goals. Often, the hardest part of a goal is starting and breaking the inertia. And sometimes, the Ebright Azimuths of the world are the perfect place to start your journey to achieve your dream. I can think of no better example of how the commitment of a nation, and taking one small step at a time, can lead to achieving a dream.